Anand 'Kav' Kaviraj, our resident artist and comic book guru has written a great article about the Whytheville Pedigree comic book collection. These books came to be known as, you guessed it, The Mile-High Collection or the Edgar Church collection. Since these books where in a cool dry climate, they where wonderfully preserved and in stunning condition for their age. Amazingly, the older books were in the best condition, as they were at the bottom of the 8 foot high stacks and thus virtually untouched by air. These books you could actually still smell the printer's ink on and the pages were white and supple. Included in the collection was a complete run of Action Comics including #1 in an estimated 9.4 condition-it is unknown the exact condition as the current owner refuses to get it graded. I can understand how difficult it would be to let a book like that out of my control for a second! Comic book bags and boards where only around from the early 70's on so it usually the luck of the draw on finding high-grade issues prior to that. Early Silver-Age issues in high-grade are usually ones that where in the middle or bottom of a stack of books that have been left untouched for years. The fact that a book is sandwiched between other books meant it was safe from aging factors like sunlight and air. One of the problems with early Golden-Age books is that there are not a lot of them around, period! In the 1940's, during World War II, they used to have massive paper drives for the War effort and millions of kids dutifully brought their comic books to the curb to be turned into pulp for much needed military paper products for the boys overseas. To further exacerbate things, many more were destroyed in the infamous 'war on comic books' instigated by the vile Dr. Wertham. To find a large cache of these early 1940's comics is amazing in itself but to find a huge collection in tip-top condition seemed to be a once in a life-time event. Indeed there were other Golden Age pedigrees to surface, the San Francisco, Lamont Larson, Cosmic Aeroplane, Denver, Allentown, Recil Macon, 'D', Blankas-Salida, Pennsylvania, Carson City, Hawkeye, Windy City, .Crescent City, White Mountain, and Bethlehem collections, but none could match the depth and condition of the Church collection. 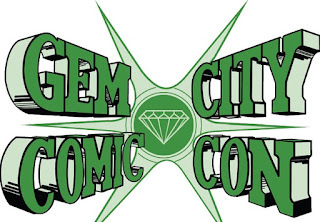 With all the buzz about Golden-Age pedigrees and not a lot to be had, some truly beautiful Silver-Age runs have now shown up at the door step of the Certified Guarantee Company or CGC to be certified and graded. CGC requires proof of the find and that they grade the entire collection in order to establish a 'pedigree'. The "Wytheville" pedigree collection was found by long-time dealer Kermit E Osserman, who first learned about the books by seeing a few offered on Ebay. He noticed that the seller was from Virginia and that they where offering some very interesting key issues like Marvel Spotlight #5, first appearance of Ghost Rider! After purchasing all the man had to offer that week on Ebay, a dialogue was opened up and discussions ensued to allow Kermit to come to Wytheville and purchase the huge collection of silver and bronze age books in one massive buy. The owner of the books was a police officer whose brother was a hoarder and a loner. The boy bought every book off the rack, each week, one at a time, over the course of years. The "Wytheville" collection stood in some 40 long boxes and 30 or so square boxes. The brother had done some sorting of the books by placing them into runs. You could see that, after months and months of sorting, he had barely scratched the surface. There where huge runs, in issue number order, untouched for years. There is a certain smell to a comic book that has aged over the years, referred to as 'acid' due to the bleaching compounds used in the production of paper and which, when reacted with oxygen, slowly corrode and yellow paper products. There where runs of DC's Our Army At War, Sgt. Rock, Star Spangled War Stories, high-grade Richie Rich issues in the pre 100's. Then there where the Amazing Spider-Man runs, Action Comics runs, then Marvel Horror books like Crypt Of Shadows, Where Creatures Roam, Where Monster's Dwell, on and on. Each box was more amazing then the last. After four hours of looking through all the boxes and doing some calculations, Kermit was ready to sit down and discuss pricing for the lot. There where two serious draw-backs on the collection. About twenty percent of the books had sustained water damage in moving them from the brother's house to the officer's basement. This of course figured into the final negotiations. The other problem was that all the key issues had been removed. There was no Hulk #180, #181 nor #182, no Iron Fist #14 etc. In fact there was no number one issues of any of the runs that had started at the beginning. In the final compromise, they settled on several thousand dollars for the lot. It took two trips with a Toyota Highlander filled to capacity both times to get all the books from lower Virginia to Charlottesville, which was three hours away, and it has taken nearly a year of intermittent listing and grading to get the best of the best onto Kermitspad.net and Ebay! 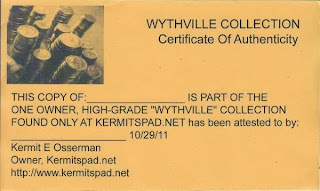 Wytheville pedigree books or 'Wythville' as Kermit calls them can be recognized by the gold certificate Kermit provides with each book he sells.